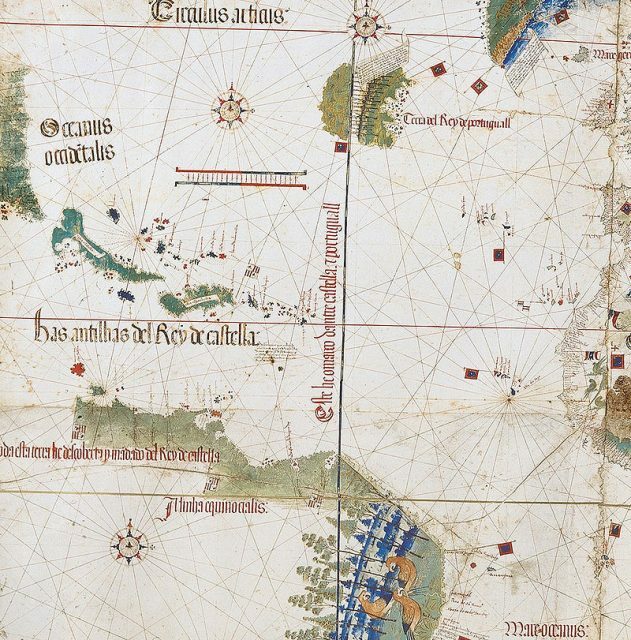 In the early 16th century, European nations sought out information collected and recorded on nautical maps. This made coastlines, harbors, and rivers into resources, and these details could translate into an advantage during wartime or explorations for any seafaring nation trying to claim a stake in new lands. Created in Lisbon, the Cantino Planisphere was six pieces of parchment attached to a large canvas that measured about four by eight feet. A Planisphere is a sphere represented as a plane, or flat surface, and is typically used in star charts. Alberto Cantino, who created the Planisphere, was working in Portugal as an undercover agent of the Duke of Ferrera, Ercole I d’Este in Italy. There are differing accounts regarding Cantino’s acquisition of the map, including one in which he contracted a mapmaker to sneak into a Portuguese repository of nautical charts and compile the information required to construct the map. Other historians contend that the map already existed and that Cantino bought it at considerable cost. However the map was acquired, records do definitively show that Cantino paid 12 gold ducats for it – a hefty sum at the time. 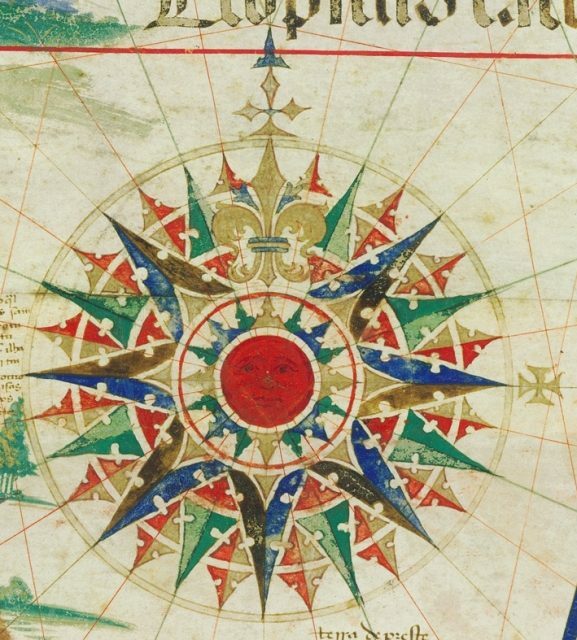 Completed in 1502, the Cantino Planisphere was the second ever chart to depict the New World. Included was hitherto unknown and unpublished information regarding Portuguese trade routes; ongoing discoveries along the coastline of what would become Brazil; and even other faraway places like Newfoundland, Greenland, Africa, and India. It has the distinction of being the first map to shed the conventions of both medieval and renaissance mapmaking and therefore qualifies as the first truly modern map. Mapmakers of Cantino’s age had no easy task. Their job was to compile the extensive oral and written historical sources and amalgamate them into a single comprehensive and detailed image. 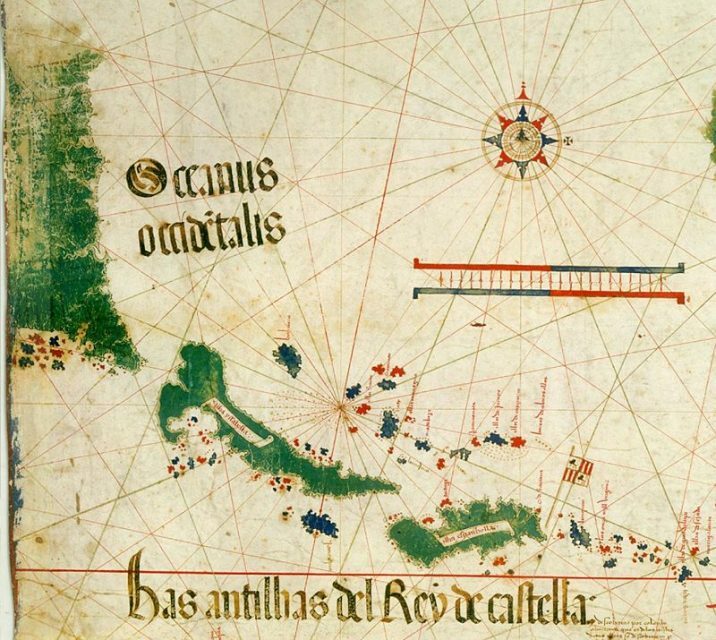 A year or two before Cantino’s map, Juan de la Costa, a colleague and compatriot of Christopher Columbus, compiled the earliest known depiction of the New World. 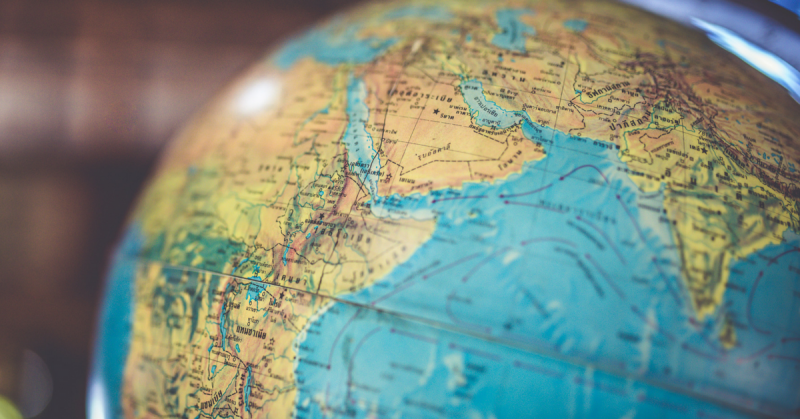 Both maps display the reality of the circumstantial challenges posed to New World cartographers, who were forced to rely on centuries-old cartographic traditions. Important as they are, maps such as the Cantino Planisphere were considered state secrets, and accordingly, they were closely guarded lest they should fall into enemy hands and result in a loss of strategic and commercial superiority. Naturally, this made them a high priority for spies such as Alberto Cantino. The political and economic consequences of the Cantino Planisphere were considerable for the Portuguese. In 1499, two full years before the map was created, Vasco da Gama returned from India with ships full of spices and other commodities. Many other Italian merchants like him had been acting as intermediary dealers between the European powers and the East. The map changed that, reducing the Italian monopoly to a shambles, and the major German trading and banking companies who had been buying their goods from the Genoese and Venetians at extortion monopoly rates came knocking on Lisbon’s door. Overnight, Lisbon usurped the Italians to become the center of European trade in exotic goods. This had the unintended side effect of transforming Lisbon into a hub of intrigue and espionage, as trade secrets like those displayed on the Cantino Planisphere were in high demand by foreign merchants, who sought the economic advantage they would henceforth grant over their suppliers or competitors.